It’s a near complete paradigm shift for us! We held the first high school race of the season for all of Vermont on December 14. We could not have dreamed of this in years past. This was a new race for us, so additional revenue we would not have had otherwise. We did not visit Sugarbush or Bolton once this season because we could not pull off training at MRG. We hosted Harwood Duals (modeled on Stowe Duals) with two pieces of terrain; a roll on the top flats and large, 3+ foot drop/pro jump near the bottom of the race hill. The roll and the jump are not possible without the snow depths and groomer. We added a U14 race back to the schedule. Again, a race we would not have otherwise had if we didn’t have the snowmaking. Additional revenue to the mountain. We built a spine under Lift 4 and built four rollers (washboard) on the race trail flats above Eaton’s for ski school and race to play/train on. The trail width under Lift 4 flats is because of additional snowmaking. It has given us space for the park and a trail. Additional grooming on the upper mountain has given us access to train on Porky and Loon; this additional space is critical for quality training and to safely prepare our kids for the increasing challenges of youth races. We hosted the Rockefeller Challenge safely in part to grooming. The additional snowmaking filled in the compression at the bottom of the pitch so it wasn’t a hard compression and we could install safety netting which requires adequate snow depths. Our race start is higher and wider because they were able to make more snow to build the mound higher. 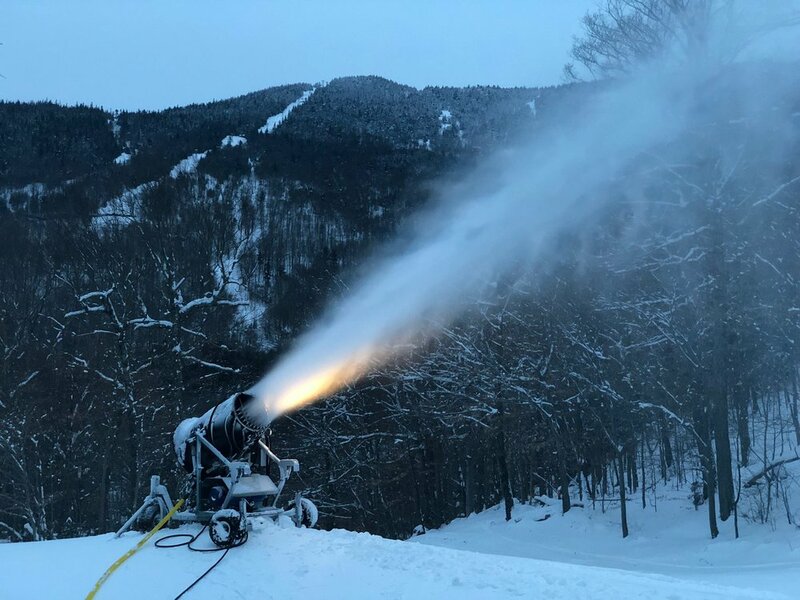 The additional snowmaking on the pitch allowed us to set several courses down the hill making better use of our hill space and training time. It also allows for users of the jump to land and turn “right” on good snow as opposed to turn “left,” avoid rocks/bare spots and arc into the hill where training is going on, creating a safety issue. The additional snow means our drills and drill bits (which are silly expensive) last longer and our gates go in the ground to proper depths. Safety netting requires a minimum snow depth to be set in and to properly function. This cannot be overstated. We cannot host or really train without safety netting. To help fund continued improvements such as this, please donate today. All donations will be doubled until the end of the campaign on April 30!